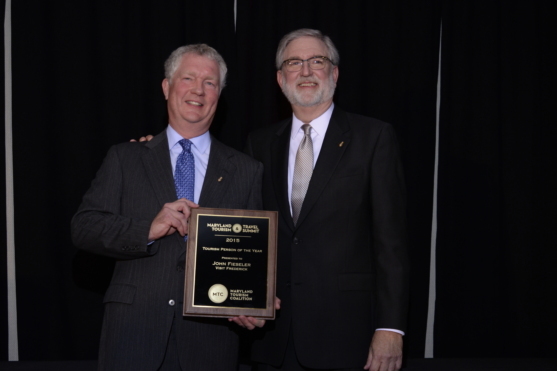 Frederick, MD – Executive Director of the Tourism Council of Frederick County John Fieseler has been named Tourism Person of the Year by the Maryland Tourism Coalition (MTC). The award was presented to Fieseler last Thursday at the 35th annual Maryland Tourism & Travel Summit, held at Turf Valley Resort in Howard County. It was announced during the MTC Awards presentation and banquet, part of the 3-day annual summit that brings together more than 250 tourism and hospitality professionals from throughout the state of Maryland. Tourism Person of the Year is a prestigious professional award given to an industry leader whose exceptional commitment has significantly enhanced and perpetuated the tourism industry in Maryland. Fieseler has served as executive director of the Tourism Council of Frederick County since December 1997. He served on the board of directors for six years, including two as board president, prior to assuming the director position. As executive director he represents Frederick County in the Maryland Association of Destination Marketing Organizations, is a past chair of the organization, and currently chairs the Research Committee. Fieseler was appointed by Maryland’s governor to serve on the Maryland Tourism Development Board and also sits on the Maryland Heritage Areas Authority. He is also a member of the board of directors for the 6-state Civil War Trails organization. He has been a presenter at national tourism conferences including the Destination Marketing Association International annual convention and U.S. Traveler’s annual Educational Seminars for Tourism Organizations. Throughout his years with the Tourism Council, Fieseler has served on dozens of local committees and boards, including current positions on the boards of the Downtown Frederick Partnership, the Heart of the Civil War Heritage Area, the American Red Cross, and Goodwill Industries of Monocacy Valley. He’s a past president of the boards of Hospice of Frederick County and the Rotary Club of Frederick, and a former board member of the Frederick Arts Council. Under Fieseler’s leadership, tourism continues to steadily grow in Frederick County. He led the organization to purchase, rehabilitate, and open the building at 151 S. East Street in Frederick as its visitor center and offices. When the State was forced by budget limitations to close the Mason-Dixon Welcome Center in northern Frederick County, Fieseler worked cooperatively with state and local partners to get funding to re-open it and install exhibits. He led the organization through many Civil War and War of 1812 commemorative events in recent years. Fieseler serves on the Downtown Frederick Hotel Advisory Committee and leads the way as tourism continues to grow in Frederick County, with increases in visitation and visitor spending. The Tourism Council of Frederick County (TCFC) is the recognized Destination Marketing Organization for Frederick City and Frederick County, Maryland. It operates the Frederick Visitor Center and related Visit Frederick programs that include Destination Marketing and Group Tour Marketing. 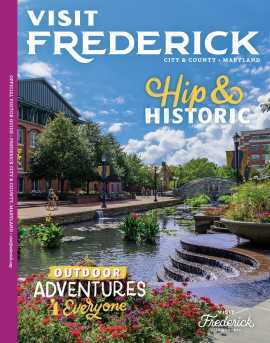 For more information about membership and Visit Frederick events, go to www.visitfrederick.org.